Hot on the back of Darren Randolph's performance in goal during Ireland's midweek demolition of World Champions Germany, young Josh Cullen starred for the U21 side in a 3-0 thumping of Lithuania last night. Cullen put in a commanding performance in midfield that won him the man of the match award. 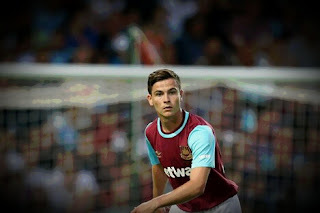 Having recently broken into the first team at Upton Park making a series of Europa League appearances before his Premiership debut in the 3-0 victory over Liverpool, its clear that his star is on the rise. All of which is great news for club and country. With only modest creative resources available to him, gaffer Martin O'Neill will be watching with interest. Although Ireland missed out on Aston Villa's Jack Grealish, Cullen offers an equally exciting prospect and although Southend born, has no hesitation in recognising his Leitrim roots. He may be an outside bet for the upcoming Euro Championships, especially if he continues on his current trajectory! If the phone don't ring, you'll know its me! Hammers to storm the Palace!